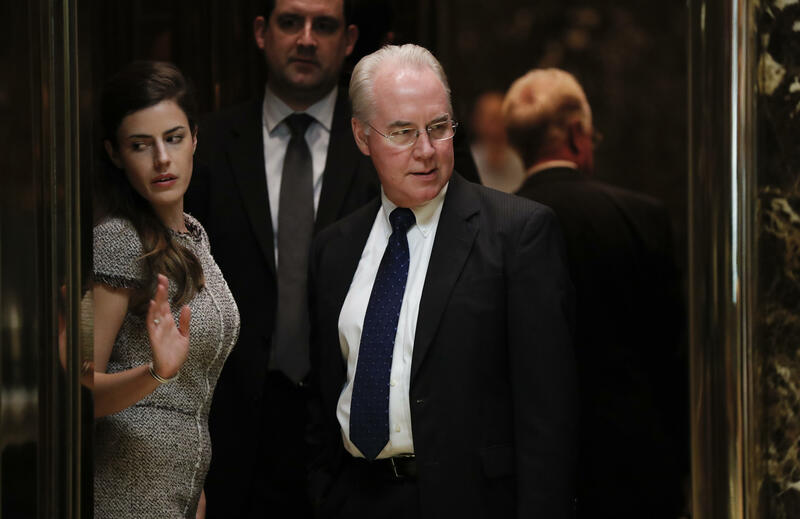 Rep. Tom Price, R-Georgia, has been named by President-elect Donald Trump as the Health and Human Services secretary, CBS News’ Major Garrett confirms, citing a senior transition source. The decision is expected to be announced Tuesday morning. The five-term congressman hailing from the Atlanta suburbs is the chairman of the House Budget Committee. He’s an orthopedic surgeon by trade, and was an early supporter of Trump’s presidential candidacy. Price has also been a strong advocate, like his fellow Republicans, of repealing Obamacare. Price favors expanding health savings accounts and providing tax credits for purchasing health coverage. Congressman Tom Price will be a great Secretary of Health and Human Services.He is the right leader to help Congress replace Obamacare. Trump met Monday with candidates for top Cabinet posts, including retired Gen. David Petraeus, a new contender for secretary of state. Trump is to meet Tuesday with Tennessee Sen. Bob Corker, who is also being considered more seriously for the diplomatic post, and Mitt Romney, who has become a symbol of the internal divisions agitating the transition team. “Very good conversation and we’ll see where it goes from here,” he said. A former CIA chief, Petraeus pleaded guilty last year to a misdemeanor charge of mishandling classified information relating to documents he had provided to his biographer, with whom he was having an affair. Vice President-elect Mike Pence, who is heading the transition effort, teased “a number of very important announcements tomorrow” as he exited Trump Tower Monday night. Pence is said to be among those backing Romney for State. Romney was fiercely critical of Trump throughout the campaign but is interested in the Cabinet position, and they discussed it during a lengthy meeting earlier this month. Other top Trump allies, notably campaign manager Kellyanne Conway, have launched a highly unusual public campaign to warn the president-elect that nominating Romney would be seen as a betrayal by his supporters. Conway’s comments stirred speculation that she is seeking to either force Trump’s hand or give him cover for ultimately passing over Romney. Conway served as Trump’s third campaign manager and largely succeeded in navigating the minefield of rivalries that ensnared other officials. Trump is said to have offered her a choice of White House jobs -- either press secretary or communications director. But people with knowledge of Conway’s plans say she is more interested in serving as an outside political adviser, akin to the role President Barack Obama’s campaign manager David Plouffe played following the 2008 election. The wrangling over the State Department post appears to have slowed the announcements of other top jobs. Retired Gen. James Mattis, who impressed Trump during a pre-Thanksgiving meeting, was at the top of the list for Defense secretary, but a final decision had not been made. Trump was also considering former New York City Mayor Rudy Giuliani for Homeland Security secretary, according to those close to the transition process. Giuliani was initially the front-runner for State and is still in the mix. But questions about his overseas business dealings, as well as the mayor’s public campaigning for the job, have given Trump pause.